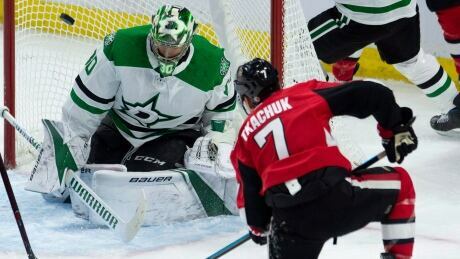 Craig Anderson made 37 saves and Ottawa scored three times in the third period as the Senators downed the Dallas Stars 4-1 on Monday. Ottawa is now 2-1-0 through three of its season-high five-game home stand. The Senators are back in action Saturday when they host the Montreal Canadiens. During the first TV timeout the Senators honoured Ray Emery, who died July 15th. He was 35. Emery was originally drafted by Ottawa (99th overall in 2001) and spent parts of five seasons with Senators, leading them to the Stanley Cup final in 2007. Emery sits fourth in wins and fifth in games played with Ottawa. With the game tied 1-1 the Senators took the lead early in the third as Dylan DeMelo put a shot on goal and Tkachuk, right in front, redirected it past Bishop. Ottawa made it 3-1 midway through the period as Matt Duchene, from behind the net, made a no-look pass to Boedker, who one-timed it past Bishop for his first with the Senators. Looking to cut the lead the Stars pulled their goalie with more than seven minutes left, and tried it again with over four minutes remaining, but Anderson was solid. The Senators pushed back in the second and tied the game in the final minute of the period when Lajoie picked up his team-leading fourth goal. The rookie defenceman showed plenty of patience and beat Bishop glove side. The Stars jumped out to a 1-0 lead on a power-play goal by Klingberg, but could have had more if not for Anderson as Dallas outshot the Senators 14-9.